Add the Realme C1 in your carts now! Realme Shopee Flash Sale is coming! Realme partners with Shopee for the Realme C1 first-ever flash sale in the popular e-commerce platform. Get the Realme C1 on sale at Php 5,590 on January 30 from 12NN to 2PM in Shopee's official Realme store. The first 50 buyers will get a Realme Buds so you better add the Realme C1 in your carts now. The RealmeBuds the company's official audio accessory; it's an in-ear earphones with 11-mm drivers that deliver 160 percent louder bass and redefined quality. Realme C1 is the current hero device of the this fast-rising brand. It's been tagged as the "entry-level king" with its value-for-money features. It comes with a 6.2-inch full-notch display, 4230 mAh battery, dual AI cameras and Snapdragon 450 octa-core processor. The handset has also been updated with Color OS 5.2.1. 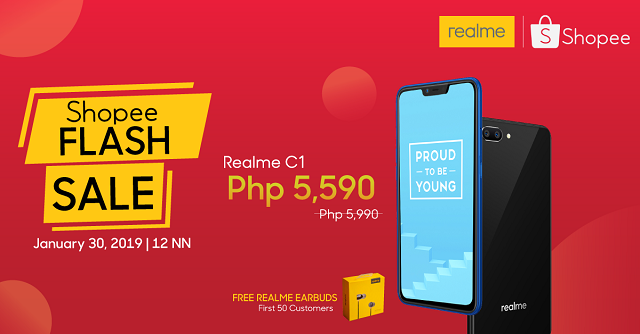 You'll get the Realme C1 in Shopee at Php 5,990 after the flash sale.